Edward Woodall, son of Thomas Woodall and Martha Pender, husband of Margaret Melinda Abernathy. Margaret Melinda Abernathy, daughter of John Franklin Abernathy and Joicy Eveline McGhee, wife of Edward Woodall. 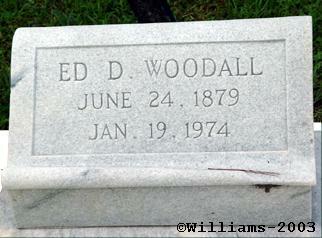 Edward D. Woodall, age 94, of Canton, died at the Coker Nursing Home on January 19, 1974. 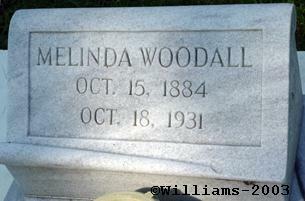 Born on June 24, 1879 in Bartow County, he was the son of Thomas Woodall. He was a member of the Cross Roads Primitive Baptist Church and a farmer. He was married to the late Margaret M. Abernathy. Funeral services were conducted at the Baker and Son Funeral Home Chapel on Monday, January 21 at 11 a.m. and interment was in the Old Macedonia Cemetery. The Rev. Curtis Fuller officiated. Survivors include seven sons: Tommy of Acworth, Talmadge of Cartersville, Willie of Atlanta, Raymond of Atlanta, Henry of Woodstock, and Howard and Harold of Canton; four daughters, Mrs. Ardell Grier of Kennesaw, Mrs. Raymond Goodwin of Roswell, Mrs. Mary Lou Chester of Canton, and Mrs. Herman Hendrix of Alpharetta, and 23 grandchildren and 33 great-grandchildren.